We believe that surfing can fuel the soul. It is a place where you can lose yourself while demanding you be present in the moment. It has worked for each of us and countless others we've introduced to the stoke. We invite you to join us for the experience! 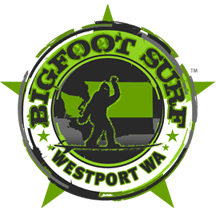 Bigfoot Surf is committed to delivering a surf lesson experience that is safety focused, student centered, ocean aware, respects the surf community and builds a strong foundation for developing surfers for just the day or for life. Start your surfing/surf lesson adventure in Westport Wa, the Northwest’s Surfing Capital. See below for helpful links to Westport area surf shops – both have surfboard and wetsuit rentals, Seattle area surf shops – all listed have surfboard and wetsuit rentals, local area hotels, restaurant’s and campgrounds. Come visit Washington’s Surf City today! Come Surf with BigFoot this 4th of July weekend. Lessons available Saturday and Sunday.